Since I'm still busy studying my little life away, and since I've noticed the life being drained out of my blog lately, I've enlisted Merith, a dear friend, to help keep Cooking Books afloat. A consummate bibliophile like myself, she has some great things to share. In my latest effort to avoid writing my thesis, I’ve taken it upon myself to entirely reorganize my mom’s house. Ironically, she is a librarian, yet is the most disorganized person I know. My first task was to attack the library – and attack I did. Around 200 books (and counting) will hopefully go to happy homes, as they were rather neglected on the bookshelves of my mom’s library. Regardless, many more remain. Of the books, my mom’s cookbook collection is rather impressive and sizeable, and up until now, unused. I now will follow in Andrea’s footsteps by attempting to use at least one recipe from each book, occasionally recording the process and outcome. After tonight, I hold even higher esteem for Andrea’s efforts – photographing food is often harder than cooking it. Even when you are a photographer (plug: A Portrait of a Woman). Natural lighting is a MUST with food photography, and tonight I failed to beat the sunset by minutes. Can’t win ‘em all. And it will get even more difficult as fall moves into winter (especially when you live in the Pacific Northwest). 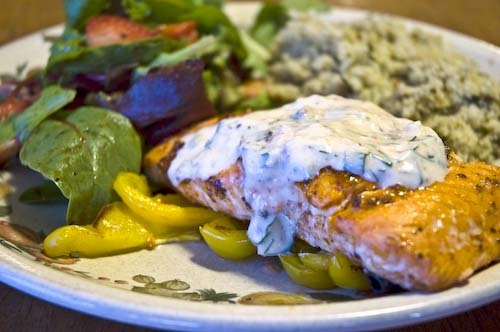 But, for now, here is a delicious salmon recipe from a beautiful cookbook called Blue Eggs and Yellow Tomatoes, a book I’ve long desired to cook from. Because I was only cooking for two, I halved the recipe and the only modification I made was that I used peanut butter instead of tahini – thanks to an unusable can of the stuff. The sauce still turned out, in fact it tasted great. I served it with couscous and a salad with strawberries and balsamic vinaigrette. Enjoy! Toast the coriander seeds in a small skillet over medium heat until aromatic, stirring frequently, about 2 minutes. Remove from the heat and let the seeds cool slightly. Crush the coriander in a mortar with a pestle or coarsely grind in a spice grinder. Set aside. 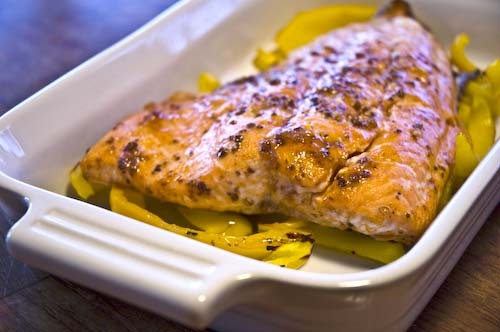 To prepare the salmon: Whisk the honey, lemon juice, garlic, olive oil, paprika, and remaining crushed coriander together in a shallow baking dish. Add the salmon and turn to coat it. Cover and refrigerate for 15 minutes and up to 1 hour. Preheat the oven to 400 degrees. Brush two large baking sheets with olive oil. Transfer the salmon to one of the prepared baking sheets and the bell peppers to the other; season both with salt and pepper. Roast in the oven until the salmon is opaque in the center and the bell peppers are tender, about 10 minutes. Transfer the peppers to a platter; top with the salmon. Garnish with cilantro and dill sprigs and serve with the yogurt sauce. Salmon is my favorite fish. This recipe sounds like one I need to try very soon. Thanks so much for sharing. Look good Merith. Michael and I eat salmon a lot. We will have to try this! Thank you for posting this recipe. As soon as I saw it, I knew that I had to make it. I made a few changes to better suit our tastes and we had it last night for dinner, delish a huge success!